Chili and Corn Bento, originally uploaded by sherimiya ♥. Today's bento has veggie chili with 3 kinds of beans, as well as chopped cauliflower and zucchini hidden within. If you do this, you might want to chop the veggies small enough that they are unrecognizable, depending on how astute your kids are. I got lazy and just threw in the chunks, so my kids immediately pointed out that those white things were cauliflower and not tofu, which is what my hubs initially assumed. I also put in a piece of yellow corn. Doesn't it look bright and summery? I love yellow in bento. Besides corn, I like yellow carrots and sweet yellow peppers; I think this color really makes the food look cheerful and delicious :) I decorated the corn with a carrot flower and cilantro leaves. And because chili goes with rice, I put some in a little cup as well, with nori and ume furikake sprinkled on top. We have some nice fruits in the house right now, and I was able to give him cherries, a big juicy sliced strawberry, and some kiwi flowers. Sheri, I'm catching up on your blog. Hehe, it's funny how quickly they found the cauliflower. I love the kiwi flowers. OMG! Who doesn't love Pokemon? I'm admiring your technique on the corn. Very pretty. And heck yeah, chili goes with rice!!! Super duper bento box sheri! i love chili with all of these things - rice, corn, and cilantro. perfect meal, and the most cheerful and sunshine-y chili meal i've ever seen!! This is my hippest "boy" bento, and my boy is finally super happy about it! 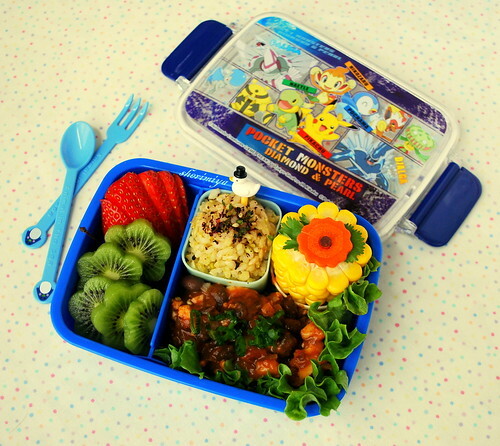 I am so jealous of your store that has pokemon bento boxes! I wish we had stores like that near me! I always put veggies & stuff into chili too: carrot, corn, zucchini, cauliflower, chick peas, broccoli, etc. The first time I had chili with vegetables was at one of the Grand Canyon lodges in a bread bowl and it was soooo good! Hi Jenn, I hope the cute boxes find their way to your stores soon! Thanks a lot! veganf, chili seems more satisfying when filled with chunky veggies, and I think kids are more likely to agree. I LOVE bread bowls, that sounds fantastic!! So cute! Your bentos are such a fresh wind of good cheer, a real lift to see and read about! Enjoying the golden corn-flower, the crisply defined kiwi-blooms, and the healthy goodness in every section of this bento! My adorable nephews Carson and Devin are very into Pokemon, btw! Very cute!! I love how fresh it looks- wonderful for a January!! Thanks Lia! How about your kids, do they like Pokemon? Thanks Susan! Not sure I like it as much...it'll take getting used to. And here I thought we only ate chili and rice in Hawaii :] All time favorite, glad to see it in bento-form! Omg, I grew up in Hawaii and my Zippy's of choice was always chili rice! Yum!